Earlier this week Markit released Eurozone, France, and Germany preliminary PMI reports. All show further deterioration. GermanyMarkit Flash Germany PMI® shows Manufacturing weakness behind moderate drop in German private sector output during October. At 48.1 in October, the seasonally adjusted Markit Flash Germany Composite Output Index was down from 49.2 during September and signalled a further moderate reduction in overall private sector business activity. The index has now posted below the neutral 50.0 value for six consecutive months. With the latest reading close to the average for Q3 2012 (47.9), the latest survey suggests an ongoing lack of momentum across the German private sector economy. Lower levels of output were recorded in both the manufacturing and service sectors during October, with the former indicating the sharper decline over the month. The slight drop in services activity followed signs of stabilisation during September, while the sub-50 index reading for manufacturing production was the seventh in as many months. Manufacturers pointed to a sharp and accelerated decrease in new orders intakes during October, thereby extending the current period of decline to 16 months. Reports from survey respondents overwhelmingly cited weakness in export markets, especially southern Europe. A number of firms also mentioned subdued demand from the automobiles sector. Some panel members pointed to signs of a slowdown in Asia, especially for investment goods. Overall levels of new work from abroad in the manufacturing sector dropped at the second-fastest rate since April 2009 (only exceeded by the fall this August). “Germany’s private sector suffered a disappointing lack of momentum in October, reversing the signs of a step in the right direction during the previous month. The ‘flash’ output index fell back from September’s four-month high largely in response to a sharper drop in manufacturing production. Markit Flash France PMI® shows further marked contraction of French private sector output at start of Q4. The performance of the French private sector economy remained weak in October. The latest Flash PMI® data signalled only a slight easing in the rate of decline of output from September’s three-and-a-half year record. The Markit Flash France Composite Output Index, based on around 85% of normal monthly survey replies, registered 44.8, showing only a small rise from the previous figure of 43.2. Although moderating since the previous month, rates of contraction remained considerable for both services and manufacturing output. Panellists generally attributed lower activity levels to a further drop in incoming new business. The index measuring overall new work was only marginally above September’s 41-month low, and remained indicative of a steep pace of decline. Anecdotal evidence pointed to weak demand conditions amid a difficult economic climate. There were reports that clients, especially some firms in the autos sector, had postponed orders and reined in investment due to a lack of confidence in the outlook. Manufacturers again recorded a particularly steep drop in new work, primarily reflective of domestic weakness but also affected by the fastest fall in export sales since May 2009. The rate of decline in employment in the French private sector remained marked in October, holding steady from September’s 33-month record. Job shedding was broad-based across the manufacturing and service sectors. 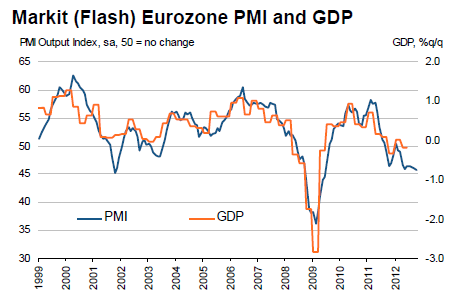 Markit Flash Eurozone PMI® shows the Eurozone downturn deepens at start of fourth quarter as PMI hits 40-month low. Flash Eurozone PMI Composite Output Index at 45.8 (46.1 in September). 40-month low. Flash Eurozone Services PMI Activity Index at 46.2 (46.1 in September). Two-month high. Flash Eurozone Manufacturing PMI at 45.3 (46.1 in September). Two-month low. Flash Eurozone Manufacturing PMI Output Index at 44.8 (45.9 in September). Two-month low. The Markit Eurozone PMI® Composite Output Index fell for a third successive month, down from 46.1 in September to 45.8 in October, according to the preliminary ‘flash’ reading based on around 85% of usual monthly replies. Output has fallen continually since September of last year with the exception of a marginal increase in January. Output continued to fall in response to a further marked contraction in new orders. The rate of decline in new business eased slightly since September, which had seen the largest drop since June 2009. For a change, I am in 100% agreement with Chris Williamson. European GDP has been resilient but do not expect it to last. Germany has been resilient and do not expect that to last either.